Ok, that’s a little harsh! I know, but I’m glad the last week is over. Linda is tucked away safely in her packaging, which I won’t let L ever find again. The packaging, not Linda. A friend does her EOTS for the “12 Days of Chritmas,” which I’m thinking is a great idea. Since behaviors aren’t an issue for us, Linda isn’t as necessary as it is in some homes. Who knows?! If L still shows this much enthusiasm, whom am I to rain on her happiness?! I’m not, we’ll do it again…I can’t help but love the smile, light in her eyes, and genuine happiness she gets from that creepy doll! It was a short week since Linda leaves on Christmas Eve, we got away with four days. Hey, that means we got 23 out of 24, which isn’t bad in my book. Some fun and different, some fun and boring. 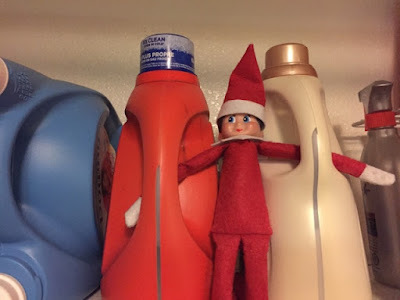 December 21 – Overseeing Laundry Duty – It was Js turn since he had the day off! 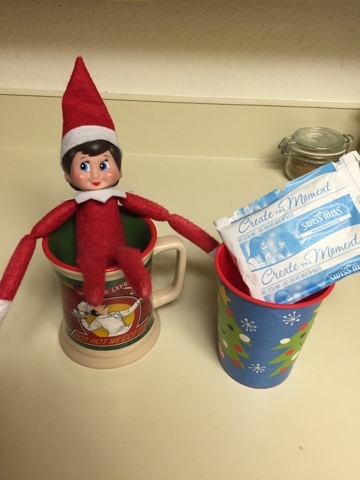 December 22 – Hot Choco Dip in a New Cup – L didn’t drink hot cocoa cause her cousins came over and they made gingerbread houses, but the cup came in handy for Santa’s milk! 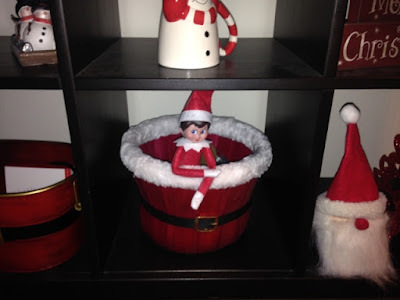 December 23 – Oops – I thought we forgot about it, but J to the rescue! December 24 – Farewell, Linda! 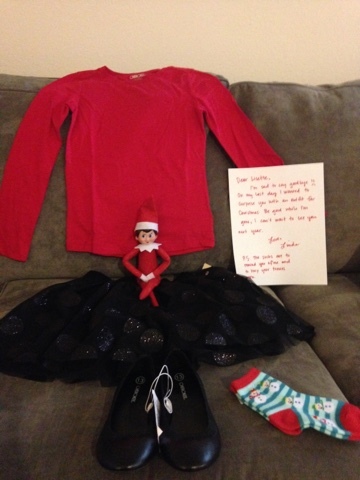 – She left L a Chriatmas outfit (an idea we totally stole from a gym friend) and left a goodbye letter! Hallelujah, we are DONE! I won’t Miss Linda, but I’ll miss Ls excitement for her. Now to secretly pack her away with the Christmas decorations and not get myself caught up again! In theory EOTS is great. In actuality, I am too lazy for all that. But thank goodness for Pinterest and my creative friends who’s ideas I can copy instantly! Also, having to make up stories for an EOTS that wasn’t even ours was also something I hadn’t anticipated, but went with it. I do love the creativity outlet it provides, if I’m in the mood to be creative and have tools at my disposal. Next year I’ll be more prepared, since I won’t want to re-create the same Linda adventures as this year. Everything is still TBD…I’m not committing just yet!